The goal of the Karen Tobacco Free Program (KTFP) is to educate the Karen community on the harms of tobacco, and to eliminate the use of tobacco in indoor and outdoor settings. 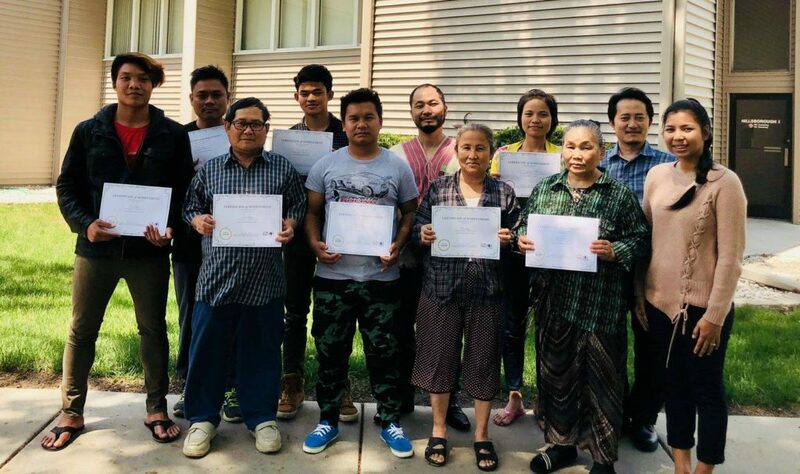 We want to reduce tobacco use for all refugees from Burma in Minnesota. Ultimately we want to see the community healthy. 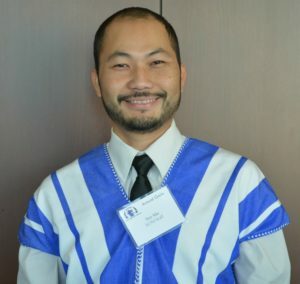 “I especially want to help with tobacco prevention because I know the consequences, it happened to me, and I want others to be healthy,” said Ner Mu, KOM Community Health Educator with the Karen Tobacco Free Program. We partner with WellShare International to provide culturally appropriate services and resources in Karen to the community. 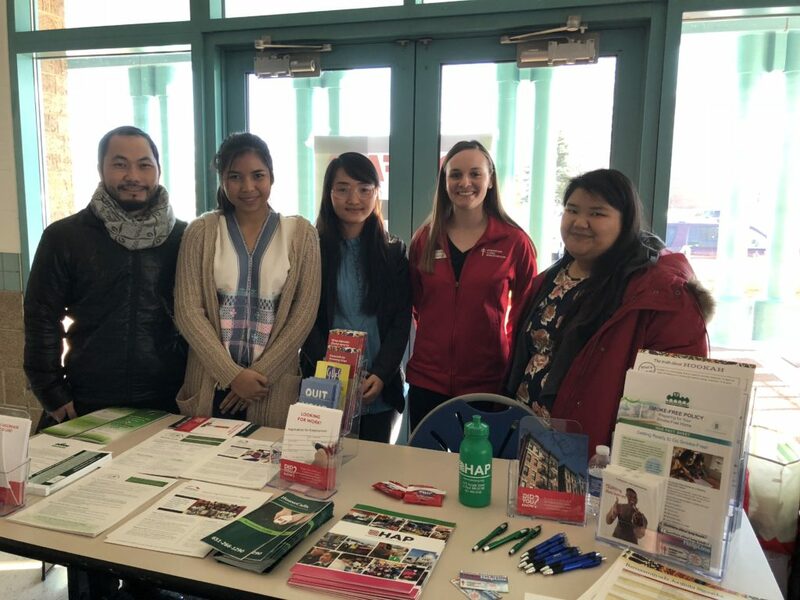 Jennifer Plum is the Program Manager with WellShare, Has Kru Moo is a Part-Time Health Educator with WellShare and Ner Mu is a Health Educator with KOM. 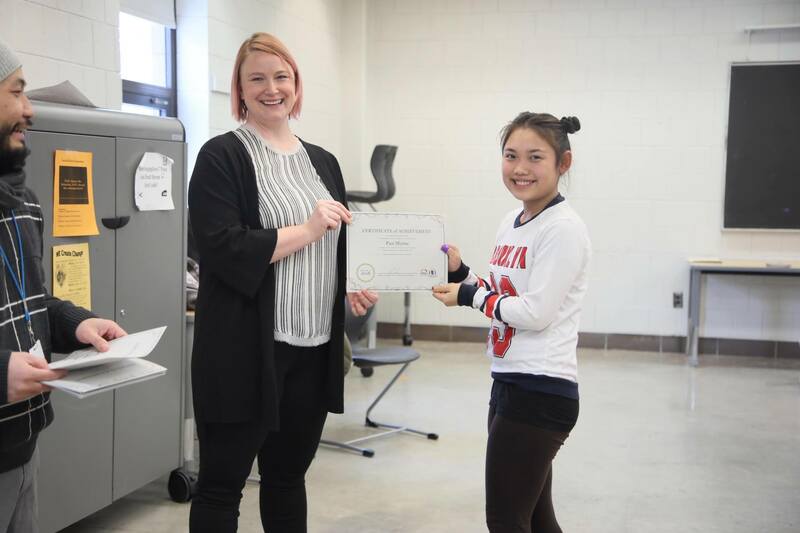 Jennifer Plum awards a certificate of completion to a Humboldt High School student after she completed the KTFP classes. “Back in our home town, we didn’t get education about the harms of tobacco use. Some children start using tobacco at as young as 7 years old, which can cause many health issues. It’s important for our parents, grandparents, youth and the next generation to learn about the health risks caused by tobacco, so we don’t see our people with many diseases, and kids exposed to second-hand smoke. 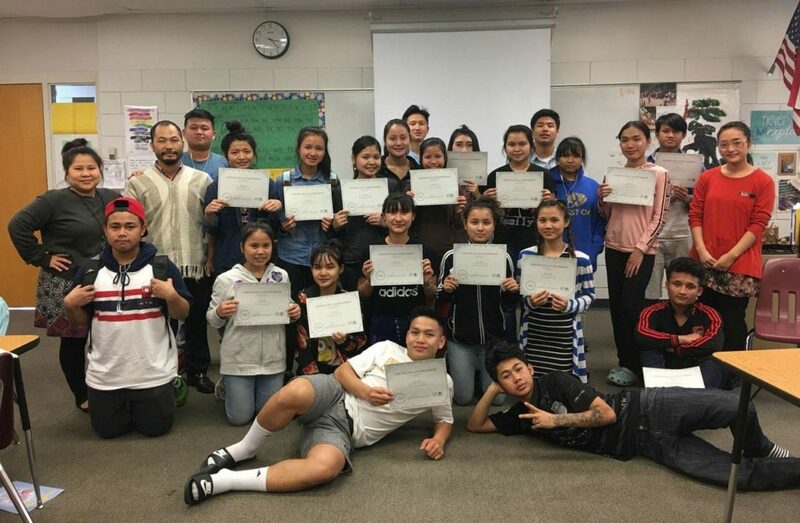 We want to spread more information to the community about how to take good care of ourselves,” said Ner Mu, KOM Community Health Educator with the KTFP. What has the program accomplished? In almost 3 years we’ve completed many classes with both elders and youth, and we continue to work with religious leaders who support us. So far, we have taught 135 adults and 167 youth about the harms of tobacco use, including smoking, chewing betel nut and other tobacco products. We’ve also done a lot of outreach through tabling at events both in the Karen community and with other partners, agencies and communities. “I’ve seen a lot of change. Before we started the program, at church or community events I saw a lot of people smoking and chewing tobacco and betel nut. We posted no-tobacco signs at events and other places and I don’t see many people smoking outside anymore at churches or events,” said Ner Mu. What do participants say about the classes? “They say, ‘this program is very good. Because of this program, we know how to take care of ourselves. It is good for our next generation.’ They want us to keep doing this education in all places where Karen people live.” said Ner Mu. 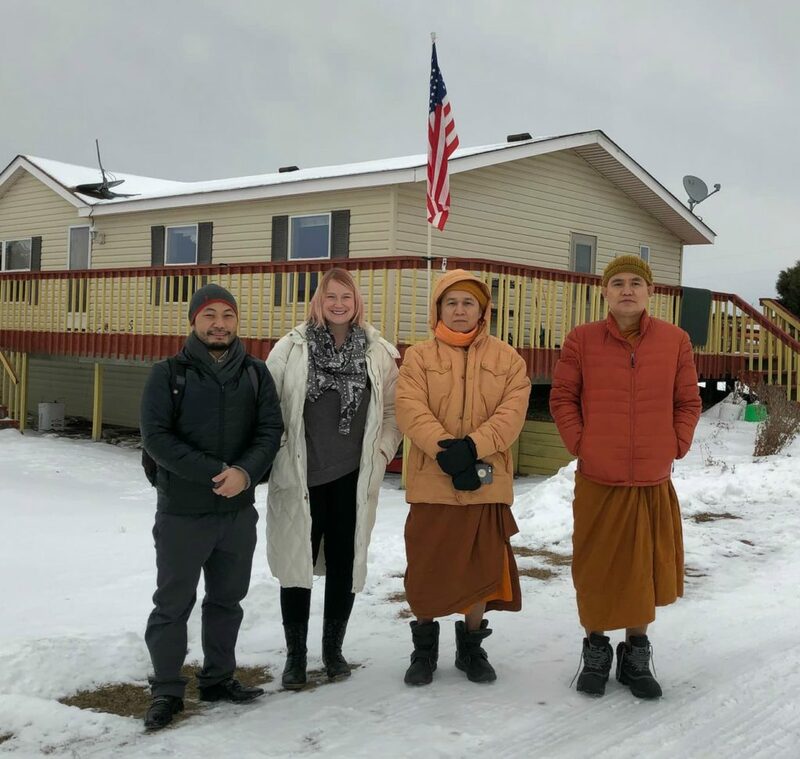 Ner Mu, Jennifer Plum, and Hsa Kru Moo (not pictured) meeting with Karen Buddhist monks in MN to talk about providing the Karen Tobacco Free Program classes to the community. What is the KTFP’s main focus currently? We continue to do a lot of outreach and education about tobacco prevention and smoke-free policies. We would like to step into quit plans to help people get on the path to quitting using tobacco. Right now, what are we excited about in looking forward with the KTFP? We have an event coming up in September! We are working on organizing the Karen Health & Resources Fair, which will be the first of it’s kind in the USA. We received funding from the Headwaters Foundation, and the event will include a women’s volleyball tournament, men’s caneball tournament, children’s soccer tournament, an art competition and a poetry competition both related to health. We will invite other health programs and agencies to participate, and we are looking forward for a lot of Karen people to show up that day, come together and check out a ton of great resources! “I started smoking when I was 13 years old in the refugee camp, just sometimes when I hung out with my friends, and I smoked until I completed high school. Before playing soccer, I would smoke 2-3 cigarettes, and it made me feel like I had more energy. Later on, I started coughing, so I went to the doctor in the camp and they told me I had asthma. When they asked me if I smoked, and I said yes, they told me I should stop because my lungs were not clean. After that, I quit smoking for about 6 months. When I moved to the Netherlands, I started smoking again with some of my new Dutch and Moroccan friends. I started to feel exhausted, nauseous and out of breath, so I visited the doctor again and once again, they told me to quit smoking. It was at that time that I decided to quit on my own. I began to hang out with friends who didn’t smoke, I did more exercise and I concentrated more on my studies. I found new friends through my church. At that church, there was a deacon and her husband who would organize soccer games for all of the refugees in the community to come together and play. As time went by, I felt like I didn’t want to smoke anymore. Before, I used to get mad when I couldn’t buy cigarettes, but later, I didn’t want them anymore. During the first week that I quit smoking, I felt like something was missing in my life. It was hard when my friends at work would take their smoke breaks and invite me to join. When I said no, they asked me why I wasn’t joining them, and I explained to them that I wanted to be healthier in my life and for my future. After asking me a couple times, they understood and respected my decision. The Karen Tobacco Free Program began in 2015. Read more about the program on our KOM website or contact Ner Mu to learn more.